Products are the "foundation" for tracking online payments. You can sell any type of product such as membership, defined contributions, donations, spirit wear, etc. There is also no limit to the number of items you can sell. Product Name: This is the title of the item as it appears in your cart. Make sure you make this unique for each item making it easy to report. Product Type: The system supports General, Membership, Donation and Print Directory product types. Please go HERE for details on how each works and affects the cart. Category: Optional. You can create Categories for Store Filtering or Report grouping ease. If applicable, assign which Category this product belongs to, such as Spiritwear, Membership, Events, General Merchandise. This is helpful for customers with numerous products. Item code: This code is required and will appear in your PayPal account in the purchase details. Name: What name will you REQUIRE to be entered when purchasing this item: parent, student or none. 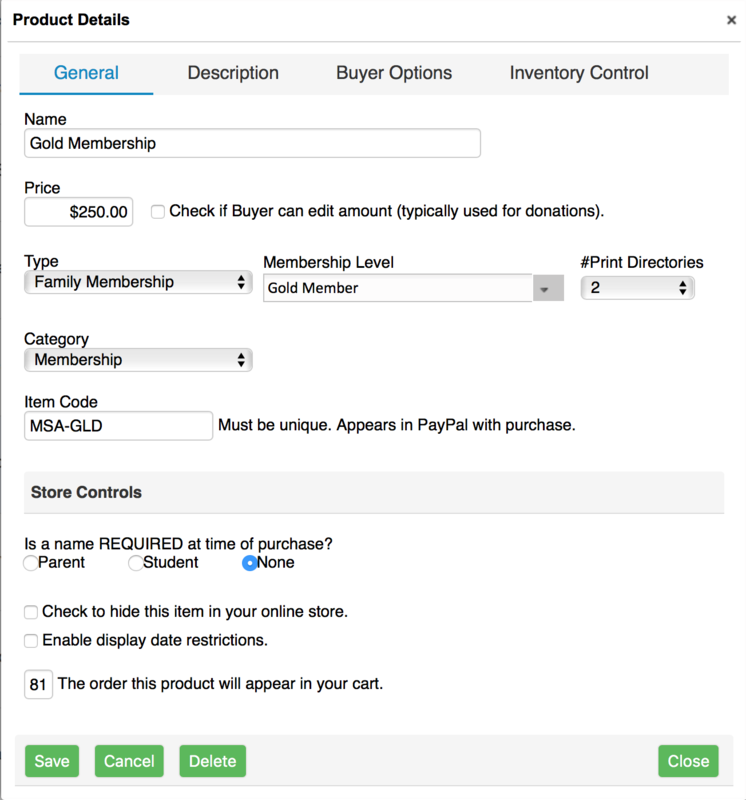 If either parent or student is required, a dropdown will be available to the user when purchasing and they will be required to choose to add to cart. Hidden? checking this box will hide this item from view in the cart. A handy way to turn items off an on. Enable Date Restriction: Optionally, you can set a date range during which the product should appear in your store. This saves the step of remembering to login and turn an item on and off on set dates. Sort Order: What order this item will appear in your cart. The Name option for a parent or student name is super helpful if you need to track a purchase to the individual and very important for membership tracking. Use the Student name required for general products if you distribute goods by class. By requiring a student name, all purchases for that product can be viewed by class (teacher) or by grade. Conversely, if you don't need a name, leave as None. All purchases are tracked to the family automatically. Give the product a unique code for your store that is different from a shopping cart you may have on your website. This way it's really easy to see what products were purchased in this cart when viewing in PayPal. Enable Buyer Memo: if checked a field will display in the cart allowing your buyer to add additional information. For example: you may be selling a custom tile for a memorial wall and want the parent to denote the text for the tile. Buyer Option #1 and #2: Options are perfect for things like size, color, etc. These are required fields if enabled. Add a label and Set the options for purchase. 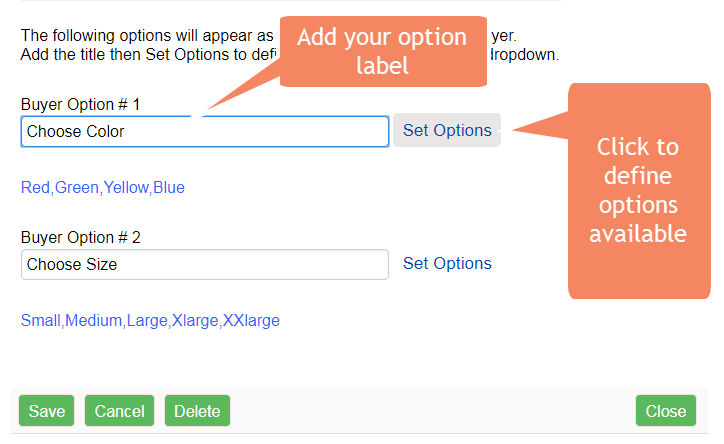 For example: Choose a Color for your label and Blue, Green, Red for the options. Check to enable inventory control in the cart. Qty Sold: the total sold. This number will increase as a product is purchased.